7 TeV collision events seen by the Large Hadron Collider’s four major experiments (clockwise from top-left: ALICE, ATLAS, CMS, LHCb). Beams collided at 7 TeV in the LHC at 13:06 CEST in Geneva, marking the start of the Large Hadron Collider (LHC) research program. Particle physicists around the world are looking forward to a potentially rich harvest of new physics as the LHC begins its first long run at an energy three and a half times higher than previously achieved at a particle accelerator. CERN will run the LHC for 18-24 months with the objective of delivering enough data to the experiments to make significant advances across a wide range of physics channels. As soon as they have “re-discovered” the known Standard Model particles, a necessary precursor to looking for new physics, the LHC experiments will start the systematic search for the Higgs boson. With the amount of data expected, called one inverse femtobarn by physicists, the combined analysis of ATLAS and CMS will be able to explore a wide mass range, and there’s even a chance of discovery if the Higgs has a mass near 160 GeV. If it’s much lighter or very heavy, it will be harder to find in this first LHC run. 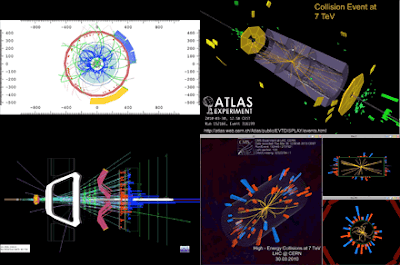 For supersymmetry, ATLAS and CMS will each have enough data to double today’s sensitivity to certain new discoveries. Experiments today are sensitive to some supersymmetric particles with masses up to 400 GeV. An inverse femtobarn at the LHC pushes the discovery range up to 800 GeV. Even at the more exotic end of the LHC’s potential discovery spectrum, this LHC run will extend the current reach by a factor of two. LHC experiments will be sensitive to new massive particles indicating the presence of extra dimensions up to masses of 2 TeV, where today’s reach is around 1 TeV. Following this run, the LHC will shutdown for routine maintenance, and to complete the repairs and consolidation work needed to reach the LHC’s design energy of 14 TeV following the incident of 19 September 2008. Traditionally, CERN has operated its accelerators on an annual cycle, running for seven to eight months with a four to five month shutdown each year. Being a cryogenic machine operating at very low temperature, the LHC takes about a month to bring up to room temperature and another month to cool down. A four-month shutdown as part of an annual cycle no longer makes sense for such a machine, so CERN has decided to move to a longer cycle with longer periods of operation accompanied by longer shutdown periods when needed. 1.CERN, the European Organization for Nuclear Research, is the world’s leading laboratory for particle physics. It has its headquarters in Geneva. At present, its Member States are Austria, Belgium, Bulgaria, the Czech Republic, Denmark, Finland, France, Germany, Greece, Hungary, Italy, Netherlands, Norway, Poland, Portugal, Slovakia, Spain, Sweden, Switzerland and the United Kingdom. India, Israel, Japan, the Russian Federation, the United States of America, Turkey, the European Commission and UNESCO have Observer status.